Now that's a waterfall. It's Palouse Falls in Washington and it's reported to be, at 189 feet, 17 feet higher than Niagara Falls. 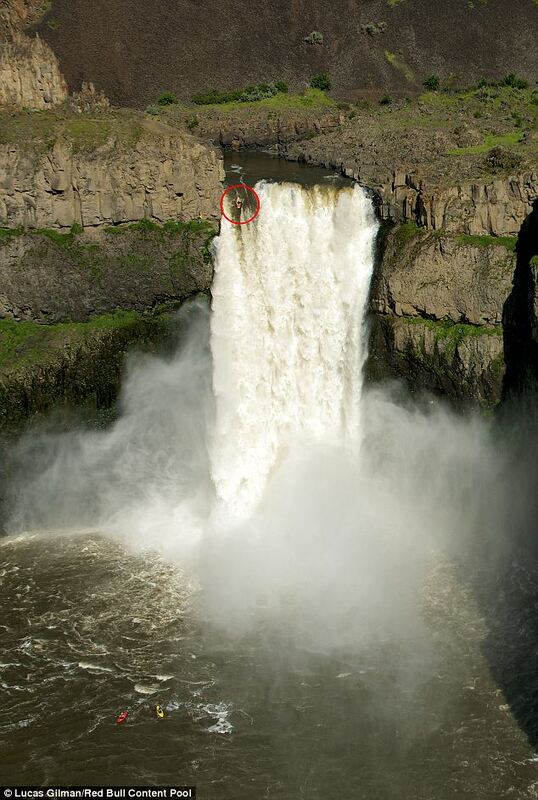 Now, look closely at the top left part of the waterfall in that tiny red circle.That there is a crazy kayaker about to plunge to his death, or one would assume he's about to plunge to his death. That crazy kayaker is Rafael "Rafa" Ortiz. But no, he didn't plunge to his death going over the waterfall. In fact, he didn't even get a scratch. He did succeed, however, in generating quite a bit of publicity for his stunt, one in which he, apparently, lives for. Click here if you want to see video of Ortiz kayaking over the waterfall on ABC's "Good Morning, America." Standing an incredible 189 feet (57 metres) tall, the Palouse Falls in the US state of Washington are even higher than the legendary Niagara Falls. Extreme kayaker Rafael Ortiz, of Mexico, recently paid them a visit – and became only the second person ever to paddle over the edge. For Rafael ‘Rafa’ Ortiz, water has more than just one dimension. The 24-year-old Mexican, who has developed a reputation for spectacular freestyle kayaking adventures, is what you might call a specialist for vertical water. 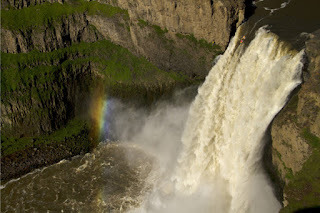 After conquering the Big Banana Waterfall (130ft/40m) in his native Mexico in 2010, Ortiz recently took things to the next level as he set his sights on the world record set three years ago by America’s Tyler Bradt, the only person to have kayaked the infamous Palouse Falls. Following meticulous preparation work, Ortiz selected the slightly calmer right-hand side of the river for the stunt. “You can steer the kayak with your body a bit for the first 30 or 40 feet, but then the water takes over,” he explained ahead of the attempt. The impact of hitting the churning white-water at the bottom was so intense that the Mexican was catapulted out of the kayak, meaning that – according to community rules – the jump cannot be officially recognised as equalling [Tyler] Bradt’s world record [established in April 2009]. Nevertheless, the breathtaking feat is yet another highlight in the career of Rafael Ortiz, who is currently on a mission to find and conquer the world’s most spectacular waterfalls. One of the more scary moments is when you realise you are ready to go for it, when you see it and you make that mental switch from being all chilled to saying ‘yes, I’m going to run a 190-foot waterfall’. I don’t think I slept well at all before it or immediately after it. It was like five consecutive nights of total restlessness. [When asked if he was all hyped-up on adrenaline] I guess so, let’s face it, it’s pretty frikkin’ scary, man! It’s pretty far from human limits. You’re not supposed to do these kind of things!